It’s official. 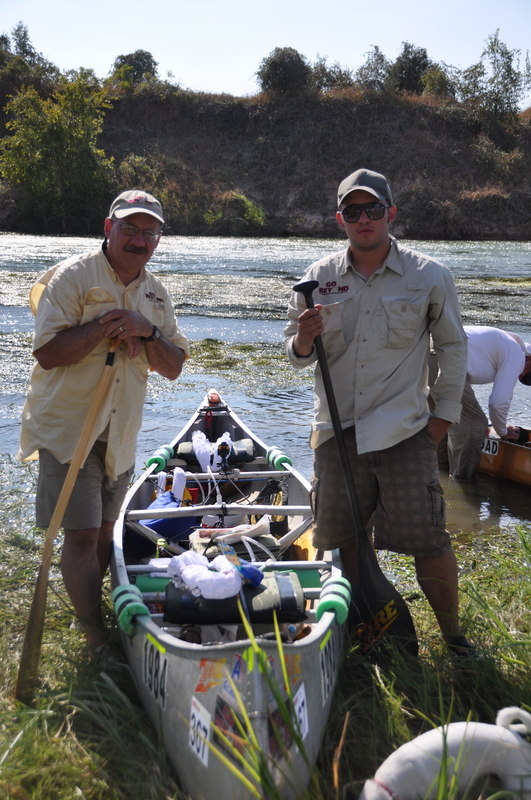 My son Jonathan and I completed the 8th Annual Colorado River 100 Marathon Canoe Race this morning. The race was everything it was advertised to be on its website: This 100 mile marathon canoe race and adventure challenge down the scenic Colorado River will test your mental and physical strength, while giving you some of the best views the river has to offer. The race course did indeed offer fabulous views of Texas flora and fauna. But it also tested my mental and physical strength. This is, without question, the toughest physical challenge I have ever faced. Our goal was to complete the course in no more than 25 out of the 32 hours allotted to finish. Jonathan and I arrived at the finish line 23 hours and 40 minutes after starting the race. When we subtract the time spent at the checkpoints and resting, we paddled for more than 21 hours. That not only tested my physical strength, but my mental strength as well. I had plenty of time along the way to meditate and to make observations. I must say that it was nice to be away from my phone and endless stream of email and to do nothing but enjoy fantastic scenery and a great adventure with Jonathan. Being a blogger, I made a mental list of observations and lessons learned along the way. These are a few of the things that swam around in my head while we paddled down the river. • Many things that sound easy to do are, in reality, harder to do. Lots of stuff looks easy to do on television. But when you actually suit up for the challenge you realize that things are not so easy after all. • The winds are not always favorable. For much of the course we battled a strong headwind. Even veteran racers said this headwind made the course extra tough. When the wind is in your face instead of your back, you just have to keep going. • It’s better to sail with a fleet. 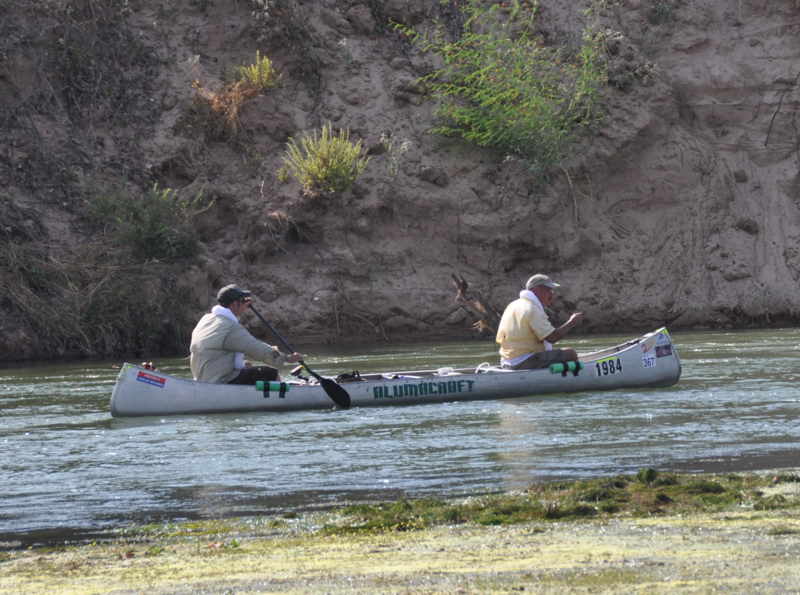 We enjoyed paddling beside other contestants and met some great folks along the way. I once heard someone say that Satan is a pirate looking for a vessel without a fleet. All of the contestants knew that help was close at hand in case of emergency. I appreciate the team that gave me three Advil along the way! • The progress of others is a great motivator. As with any race, you pass others and others pass you. That is the nature of a race. I found that seeing the kayak or canoe ahead of us motivated me to try harder. • You can learn a lot about the people you paddle with. I know my son well. But being in a canoe together for almost 24 hours reminded me of what a nice young man he is. Jonathan has the most pleasant disposition, is an encourager, sees the brighter side of challenges, and never once complained along the way. • A few minutes of rest can net you additional hours of labor. The last 38 miles of the race were the toughest because we paddled in the dark for 10 hours. Jonathan and I were both tired and decided to take a fifteen-minute break. So, we took a quick nap on a grassy bank and then were refreshed enough to paddle the remaining three hours to the finish line. • You can’t do some things without the support of the folks who work behind the scenes. My wife Cheryl and daughter Niki were our support team. They provided us with fresh water and encouragement at every checkpoint. Cheryl rubbed SportsCream on my arms and back to make sure this old man could keep going. And Gina, my youngest daughter, called from Southeast Asia to congratulate us at the finish line. The Colorado River 100 was a fun adventure, but it’s part of a bigger vision that Jonathan has to prepare me to join him on the 2012 Texas Water Safari — the 260-mile race billed as the toughest canoe race in the world. So, we’ll be spending lots more time together in a canoe between now and next June — and I will be sure to keep a tube of SportsCream and some Advil in my dry box! You two should just go for it and do the Amazing Race! Thanks. Rest is coming very easy after the race. What a great post and an even greater accomplishment. Congratulations! I’m sure you had some great prayer time. Thanks for the update and for being the man God has called you to be. You are an inspiration! Thanks for continuing to encourage me to go beyond! Thanks, Herschel. Fantastic experience that will be a lifetime memory. To get to your destination you have to paddle in the right direction and you have to keep at it, persevere. Wind, currents, rocks, limbs, snakes, all kinds of obstacles can distract us, keep us from reaching our goal. Thanks, Bruce. Good insight. Yes, we’ll have to spend time together on one of our great Texas rivers. You never cease to inspire me Omar – Whether you are traveling around the world reaching the “least of these” or paddling farther in 24 hours than most of us will in our entire life time, you make me want to push on regardless of the challenges that lie ahead…….. You live the Gospel and are an example for all to see!! Well done Omar and Jonathan. Thanks for your kind words, Sheryl. YEAH FOR YOU!! We are very proud of you! Thanks so much. I am definitely breathing a sigh of relief! Dear Omar: CONGRATULATIONS TO BOTH OF YOU although I suspect this type of thing is becoming “old hat” for Jonathan. Thanks for the link to follow as I checked it often…when I was awake. I am curious: Were the two photos attached to this particular entry taken before you started the trip, in mid-course or upon completion of the race? Have a great week Omar. Get some rest and maybe some whirlpools. I haven’t met you since 2008. I do miss you very much all the time. I am very impressed to know you finished Marathon River Race with your son. Unbelievable and incredible. I still remember you took the photos at Great Wall in Emperor’s dress. You did a great thing. You look very strong and healthy, your big belly is gone. I am looking forward to meeting you again. Great to hear from you. I too miss you and remember with fondness all of our many adventures over the years in Beijing and our many visits to the Great Wall. Yes, my big belly is gone … finally! I have lost more than 40 pounds since I last saw you. I am enjoying good health and great adventures with my son. I hope to see you again in Beijing.